I had never heard of the Stealth Bomber. I was looking at our message board last summer and I noticed a post by Gary Troutman. He is one of the most knowledgeable bass and warm water fly fishermen in this area. He found out Paula and I were going bass fishing so he gave us two to try. We were fishing for a week and didn’t use them until one evening late in the trip. Fishing was slow for some reason and I pulled one out of the box and tied it to the leader of a seven weight rod. On the first cast a bass slammed the fly. I caught eight bass in a row. The Stealth Bomber floats but when you strip it the fly dives under the surface and wiggles it’s way back to you. I noticed when I was stripping several bass were trying to grab the fly. I was amazed. Then it was Paula’s turn. She had the same result. I started reading the posts on our message board about the Stealth Bomber. The inventor, Kent Edmonds somehow ended up on the board. He’s a friend of mine. I work with him. This is a small world! Kent is a guide in Georgia but he is also one of the Sales Representatives we work with. He reps Temple Fork, Rainy’s Flies and other great merchandise lines. A few days ago I was fishing in a large pond with Frank Bryant who owns Chota Outdoor Gear. We took turns paddling his canoe around the banks of the pond. 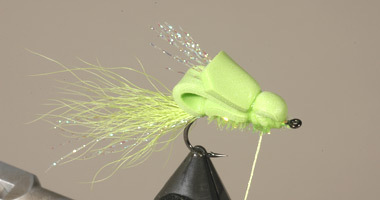 I tied on a #6 Chartreuse Stealth Bomber hoping to catch some bass. I did connect with plenty of bass but even though this fly is tied on a stinger hook with a very wide gape the large bluegill took it too. I paddled while Frank fished with the bomber. We didn’t keep count but that one fly caught a lot of large bluegill and small bass. They couldn’t leave it alone. I’m going to show you here how I tie the fly. Kent does a much better job and he has perfected it. 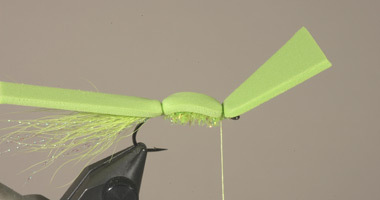 The new fly has a more rounded head and body. 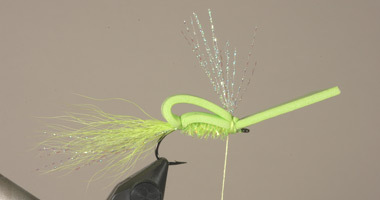 One of Kent’s companies is Rainy’s Flies and they are tying the improved version to be sold starting in September. I’m sure he will show us how he makes those new bodies. Kent tied at Troutfest, I watched him tie the new version but I didn’t see him cut the bodies. You can visit Kent’s website by CLICKING HERE. 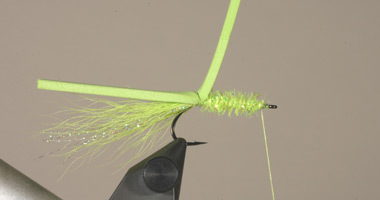 Materials: Stinger Hook, 2mm foam, Bucktail, Krystal Flash, 3/0 thread, Small tinsel or pearl chenille, Zap A Gap or waterproof Super Glue, Rubber legs, Permanent markers. The foam body is cut with a Exacto-Knife and a metal straight edge. I use a metal ruler. You can visit Kent’s template page HERE to print one. On this page look for the "Pattern Template for the Stealth Bomber Here". I printed mine on heavy paper then cut the smallest one out with scissors. I simply lay the template on the foam and mark 6 points with a mechanical pencil then cut from one to the other with the knife using the metal ruler as a guide. The finished body is a triangle with a long narrow strip. 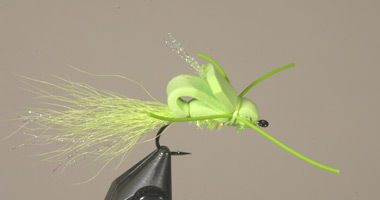 I am tying this fly on a #6 Gamakatsu stinger hook. I like this size because it catches bass and large bluegill. The small bluegill leave it alone. Step 1 – Start your thread at the eye and wind back to a point forward of the bend. 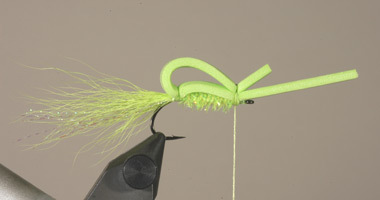 Step 2 – Tie in some bucktail and Krystal Flash for a tail. 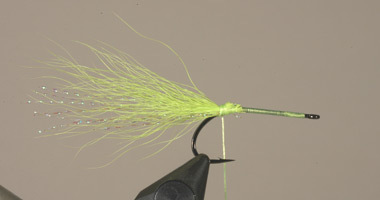 Choose the bucktail from the underside and from the top 2/3 of the tail. That hair does not tend to flare as much as the lower 1/3 of the tail. 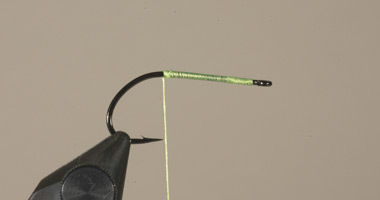 Step 3 – Lay the foam body on top of the hook. Position it so the base of the triangle is behind the eye of the hook. Tie in the strip where the tail was tied in. Step 4 – Move the thread in front of the foam strip and tie in some fine tinsel or pearl chenille. Step 5 – Advance the thread back to a point behind the hook eye, wrap the chenille forward and tie off. 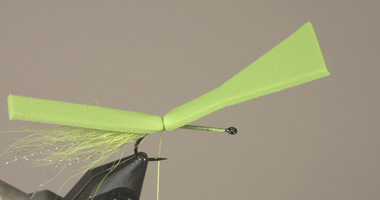 Step 6 – Tie down the foam body behind the hook eye at the base of the triangle. Make several tight wraps. 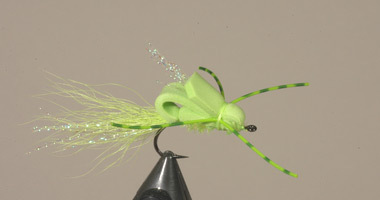 At this point I put a drop of super glue on both wraps at the front and back of the fly where the foam was tied in. Make sure the glue soaks into the wraps all around the body. You can use a tooth pick to pull some glue down onto the sides from the top of the body then add another drop to the underside. Step 7 – Fold the foam strip forward leaving a gap or loop in the body. Make several tight wraps then trim the excess foam. Step 8 – Tie in some Krystal Flash at the point where you tied in the strip. Step 9 – Your triangle is too long at this point. Using straight scissors with the front of the foam facing you make a straight cut across. I’m cutting off about 5/8”. Then cut the points of the triangle off . Step 10 – Fold the triangle back, move your thread back and tie the foam down forming a head. Make several tight wraps. 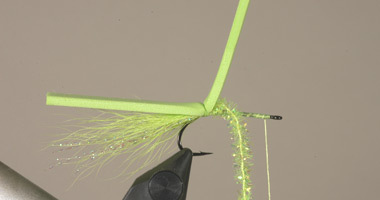 Add some more super glue to the thread all around the head and underneath including the wraps near the eye of the hook. Let the glue dry for a minute or two. Step 11 – Cut a piece of rubber long enough for two legs. 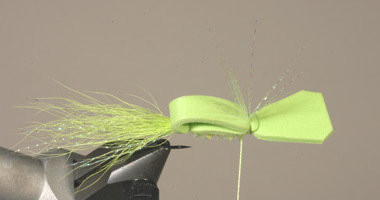 Fold the rubber over the thread and wind them securely to the body on the back side of the fly. Do the same procedure on the side of the fly near you. Whip finish then add some more super glue to the wraps being careful not to get too much on the legs themselves making them stiffer. You can use several legs on each side, use fine rubber for more action or use medium round rubber and only four legs like I did here. Step 12 – After the glue dries you may add bars to the legs with a permanent marker. I use a Sharpie with a chisel point applicator. I lay the legs of the finished fly on a piece of paper, apply the chisel to the leg then roll it back and forth in equal spaced points. This applies a band all around the rubber leg. Kent has a method of doing this by twisting the leg while in the vice, holding the marker on the leg then releasing the leg and the ink is applied as the leg un-twists. I didn’t watch him close enough at Troutfest and missed something. That does not work for me. There you have it, the finished Stealth Bomber.